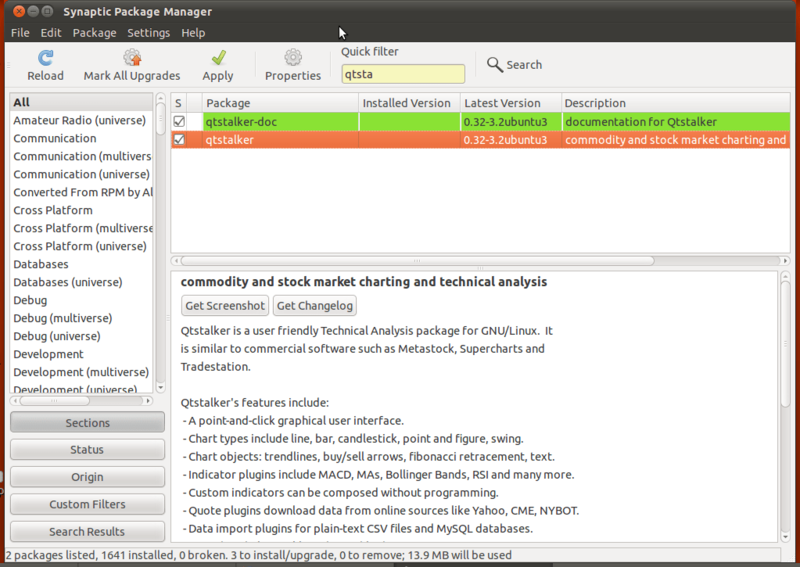 Qtstalker is 100% free software, distributed under the terms of the GNU GPL. An active development community is continually adding new features. We appreciate your input towards creating a world-class GNU/Linux TA package. 1)A point-and-click object-oriented graphical user interface. 2)Chart types include line, bar and candlestick. 3)Customizable colors. Logarithmic and linear arithmetic scaling. Scale to screen. 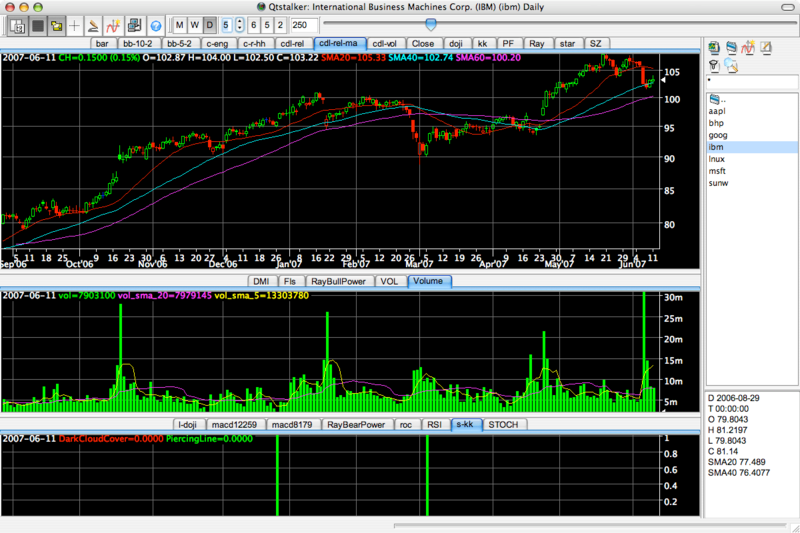 4)Indicators plugins include MACD, MAs, Bollinger Bands, RSI, and dozens more. Provides access to the TA-Lib library of common functions. 5)A simple scripting facility to create custom indicators. This powerfully enables combination of different plots in one indicator and combining of other indicators and calculations. 6)A special indicator “ExScript” enables external scripts to pass indicator data in. 7)Chart drawing objects: trendlines, buy/sell arrows, horizontal and vertical lines, fibonacci retracement lines, text and cycles. 8)Quote plugins download data from online sources such as Yahoo, CME, NYBOT. 9)Data import plugins for plain-text CSV files. 10)The “Plugin” architecture for quotes and indicators enables easy future extensibility. 11)Minute, daily, weekly and monthly chart compression options. 12)Various data classes to support for investment types such as stocks, futures, indices, ratios and spreads. 13)A back testing function allowing indicator performance tests using actual trading data. 15)A Scanner that can scan the qtstalker database for charts that meet a user defined criteria. 16)A paper trading mode enabling users to practice trading without risking capital. There may also need to modify something if an error like this appears when you start Qtstalker …/usr/local/bin/qtstalker: error while loading shared libraries: libqtstalker.so.0: cannot open shared object file: No such file or directoryTo fix this add /usr/local/lib to your /etc/ld.so.conf file and run ldconfig -v (as root). If you installed TA-Lib at a non-standard location, then edit the Qtstalker “configure” file (e.g. “INCLUDEPATH += /opt/local/include/ta-lib“). Ensure that your shell QTDIR environment variable is set to point to the location of the root Qt directory. This setting is usually something like this: ‘export QTDIR=/usr/lib/qt‘ or something similar to this. Failure to set this properly will result in make errors. If you get errors about undefined symbols when you start qtstalker, then add /usr/local/lib to your /etc/ld.so.conf file and run ldconfig -v (as root).